One early morning in Riwoche, I was awoken out of deep sleep by a very intense and insistent call: coo-coooo, coo-coooo, coo-coooo. Right outside of my room, a mildewy government-guestroom for visiting officials tucked into some former storage facility, a cuckoo was perched in a cottonwood. I recognized the call of the cuckoo right away, as does every person that has heard it once in his lifetime. It transported me right away back into my childhood and my beloved Bavarian mountain forests. I was completely surprised to hear the cuckoo in Tibet, but then I remembered that there is a famous Tibetan Buddhist text from the 8th century I had read that is called Rig pa'i khu byug, "Rigpa's Cuckoo" also translated as "The Call of the Cuckoo". But it is not just the cuckoo's call that makes this bird unique. The cuckoo (Cuculus canorus) has developed a very interesting reproductive strategy: outsourcing the raising of its offspring. The mother lays her eggs in the nests of other singing birds, often a fraction of this pigeon-sized bird. I wouldn't wish any bird a cuckoo's egg in its nest. Once hatched, the cuckoo chick kicks out all other eggs or chicks, and within weeks outgrows his adopted parental unit that must feel really confused about the look of their murderous ugly duckling. The tiny parents hardly manage to keep the little monster fed; its open beak is much bigger than their whole head. The night before, I came across heaps of fresh morels on bamboo mats and strings of morels that were hung for drying on Riwoche's main street. The call of the cuckoo beautifully illustrated why Tibetans call morels khukhu shamo , `the cuckoo mushroom'. I had known for years the name gugu or khukhu shamo, but I had no clue where it came from and it first was given to me as khukhu shamo. Just two days earlier I had learned its meaning from a mycophile forester. The morel is named after the cuckoo because of timing. Both, morels and cuckoos return each spring around the same time. In lower, warm valleys in Tibet spring, and the arrival of morels and cuckoos could be in late March, but in Riwoche - nestled between spruce covered mountains at 3800m (11,800ft) spring doesn't really arrive until May. However, vegetation growth really takes off in June with the onset of the monsoon, the rainy season. Near Riwoche, morels are collected at least up to 4200m (13,000ft), where as treeline is nearly another 500m (1650 ft) higher up. Morels also occur down to 2500m (7800 ft), which is about as low as it gets in Tibet. While many root-associated mushrooms wait until July to fruit, morels shoot up soon after the first warm spring rains or monsoon rains. For centuries Tibetans have collected and traded culinary and medicinal mushrooms. However, during the 1960s to the mid 1980s the Chinese government imposed quotas, which forced locals to collect prescribed amounts, and often paid ridiculously low prices taking away incentives to engage in the trade. In the late 1980s, the mushroom trade was fully back in the hands of rural people and the export to the Chinese lowlands increased. In the 1990s, the global market found its way up to the Tibetan Plateau offering lucrative prices for a few selected species. Now a very vital mushroom trade thrives in Tibet. Foremost to mention is yartsa gunbu, the caterpillar fungus (Cordyceps sinensis), but also culinary mushrooms like the golden "sersha" (Floccularia luteovirens, formerly Armillaria) "shadro" (Sarcodon imbricatus, formerlyHydnum imbricatum), "karsha" (Agaricus campestris), and "shi gong" (Amanita hemibapha) have a long history. For export to China, the caterpillar fungus and wood ears (Auricularia polytrich, A.auricula) had great traditional importance. However, the whole culinary fungal trade mushroomed like crazy once Japanese dealers realized that their beloved matsutake (Tricholoma matsutake, known in Tibet as "besha" oak mushroom) was being traded for cheap on markets in East Tibet and southwest China. Within a few years in the early 1990s, matsutake collection increased dramatically and an export industry was created that managed to supply fresh mushrooms from absolutely remote rugged mountain valleys to urban Japanese consumers. This trade even brought electricity to remote villages in order to produce ice for cooling the matsutake on their way to the next airport. Morels do not need any sophisticated cooling, since they dry easily and are mostly traded dried. The morel trade just hopped the running matsutake express, using its established lines of communication. In 1997 and 1998 I saw no trace of morel trade in Riwoche. Most Tibetans were not yet aware of the edibility, let alone delicacy of morels. In Riwoche as in most areas of Kham, as Tibetans know the East of Tibet, which is currently administrated by Sichuan and Yunnan, I have not found a single Tibetan who stated that morels were traditionally consumed. In the past, morels and Khampa Tibetans hardly mixed but by accident in the woods. When I returned eight years later for mushroom market research to Riwoche, several Chinese and Muslim run stores bought morels from local Tibetans collectors. I was able to observe first hand how the morel trade established itself in the early years of this millennia in the Tibetan areas of Sichuan. I first came to Nyarong in 2001 to look for ways to help the forest bureau to integrate local Tibetans into reforestation work and to introduce fruit tree growing, since logging was prohibited in 1998. The logging industry was in the hands of lowland Chinese who were brought in by the thousands and lived in their "China towns" somewhere in the middle of rural Tibet. Now, many of these Chinese workers were sent back home and the forest bureaus realized that they better cooperate with locals, because the Tibetans could be hired seasonally and for much less. In addition, the Tibetans loved the new grazing grounds that clearcuts offered their livestock, which was the major threat to reforestation. To my complete surprise, I came upon bags of dried morels at the forest department in Nyarong town, apparently some unofficial sideline business. At this point I had already collected data on the caterpillar fungus and matsutake trade, but had not heard anything about morels in Tibet. I learned that in this remote county, far off from any paved road, not to mention railways or airports, morel buyers had shown up the first time in 1999, after morels where "discovered" in neighboring Kangding County, "only" a 10 hour dirt road drive away. The discoverers were mushroom buyers from Yunnan Province looking for new sources for morels. Once they had confirmed their assumption about morel presence, they talked to local mushroom dealers and encouraged them to spread the word that there was a precious fungus. They taught some of the dealers when and where to find morels and guaranteed them a price, so that they could offer collectors good money for their first harvest. Everything seemed going great until some cunning or upset collectors figured out how to insert stones into the hollow morels and thus increase their weight substantially - in other words, low moral values made high morel value. This did not fly well with the buyers - the market take-off came to abrupt crash late in the 2000 season and nasty scenes followed. The Nyarongpas (people of Nyarong) had lost many buyers and the result was much lower prices. When I returned in 2002, the events of 2000 were still in everybody's mind, but the 2001 season went well enough that Nyarongpas kept collecting and were hoping for more dealers to come by to drive prices back up. In 2002, collectors received ¥35 (US$ 4.5, in 2007 I was told ¥38) for a metric pound of fresh black morels (Morchella elata group and M.conica), but I was told that premium whitish morels (Morchella esculenta and relatives) would fetch ¥60-70 (US $ 6.50-8) per pound. Morel export industries have developed in the western Himalayas (Pakistan & India) since the 1950s, Nepal and Bhutan followed suite much later and finally morel export mushroomed in the 1990. China and Tibet has its own tradition of morel use, but the world market accessed these resources in the 1990s. Naturally collection found its way up onto the Tibetan Plateau along the enormous river valleys that drain High Asia. The slopes of these deeply cut valleys and their less incised tributaries are covered by old-growth conifer forests. While the very humid forests around the edges of the Plateau have a dazzling array of forest tree species and according to their altitude reach from tropic to temperate, inside the Plateau in the core area of Tibetan civilization, biodiversity is reduced due to a much colder and drier climate. These temperate forests, with an annual precipitation of 500-800mm (20-32 in.) are dominated by spruce, fir and juniper species; but broad-leaved trees such as aspen, willow, birch and evergreen oaks also occur. All in all, these forests don't look much different from conifer-dominated mountain forests in North America or Europe. Having been told by Khampa Tibetans that morels were traditionally not known to be edible, I was completely surprised when Bonpo, a father of nine children in Kadak village, Pome County in Kongpo (currently Nyingchi Prefecture, Tibet AR), told me that already his great grandparents knew of the delicacy of cooked morels and collected them way before the Chinese take over in the 1950s. Looking back, I realize I should not have been that surprised to find out that traditional mushroom knowledge has a distinct local character. Since Kongpo has some of the warmest and lowest-laying valleys in Tibet locals collect khukhu shamo in March and April. Bonpo collects his morels in grassy sites around a range of different trees. During a normal day he finds about a pound a day, but some days up to five or six pounds of fresh khukhu shamo. All in all Bonpo might find with the help of one or two of his kids 50-200 pounds per season, which shrivel down to 5 to 20 pounds when dried out, netting his household ¥1750-¥7000 a year. The cash made from morel hunting in addition to money made from matsutake hunting enabled Bonpo to buy a truck, he now uses for all kinds of transport jobs, when he is not collecting mushrooms. Another time I ran into morels was in Nulang, Nyingchi County, a tiny roadside stop that had mushroomed due to its restaurants specialized in serving locally grown and collected delicacies. I was just facing such a delight in form of black-skinned chicken feet floating atop the chicken-orchid root soup. I had heard about the orchid root for a week now. Luorong, a Tibetan co-researcher, was fascinated by the restaurant business that developed around the "palm-mushroom" as it was called by the newly settled Sichuan Chinese. I was quite disappointed to find out that in reality it was a bogus fungus, since this starchy root belonged to an orchid. Although these well-clawed, black-skinned feet did not trigger any saliva production, I knew I had morel and king bolete dishes coming my way, so I was able to indulge my culturally acquired food limitations. Mr. He, the Sichuanese innkeeper, had seen the glow in my eyes and the afterglow of the camera flash when he had brought the big strand of morels from storage to the kitchen. Once I had worn him out with my insatiable fungal curiosity he introduced me to Dorje, a Tibetan from impoverished rural Shigatse, who spends most of his year here in Kongpo, making a slim but free living by hunting mushrooms and medicinals while avoiding close encounters with competing Himalayan black bears. He had tried his luck as a rickshaw driver for some years, but said the meager earnings from cycling around Chinese, Tibetans and tourists through the exhaust in Lhasa left him literally hungry and sick. Out here in the densely forested countryside, Dorje's year is structured by the collection seasons. In May and June Dorje and his wife collect mostly mushrooms, "khukhu shamo" (morels) and "yartsa gunbu" (caterpillar fungus), which provide most of their income. In July, "besha" (matsutake) and boletes follow and at the same time "wangla" (Gymnadenia) collection commences. Wangla is the hand-shaped root of an orchid common in wet alpine meadows. It is used as a medicinal in Tibet, but Dorje collects it as a special ingredient to the famous local chicken soup. He also digs"dungpo", the tubers of another, much more precious medicinal orchid (Gastrodia elata) for the Chinese market, where it is known as tianma, "heavenly hemp". At the end of summer, "kanla metok", the snow lotus (Saussurea medusa), a compositae displaying a fractally structured downy infloresence, is collected high up in the alpine zone. In late fall, Dorje works at a lumber yard where he makes ¥12 (US $1.50) per day loading timber trucks, the same amount he fetches for one excellent specimen of yartsa gunbu he collects in May [which ads up to a kilogram price of ¥30,000- ¥80,000 (US $3,750-10,000)]. 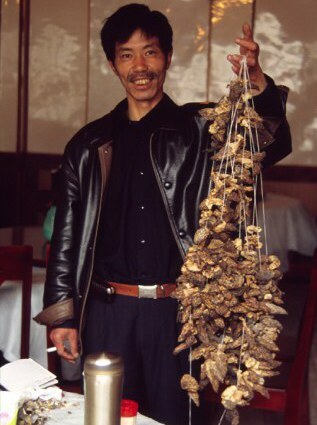 Morels do not fetch money anywhere near the elusive caterpillar fungus: about ¥600-¥800 (US $80-112) per kilogram for dried whole specimens in the Tibetan hinterland. Down in Yunnan Province, where so far most of the Tibetan morels have been exported to, a kilogram can fetch ¥1200-1500 (US $160-200). At the vegetable market in Kunming, Yunnan's capital small amounts were sold for a kilogram equivalent of ¥2500 (US$330) in July 2007. Overall, the price for morels seems to be relative stable in Tibet and adjacent areas through the years. Although the prize is dictated by a global market, morels are appreciated by Chinese consumers as well. In China, morels are not only regarded as food, but also as a myco-medicinal. 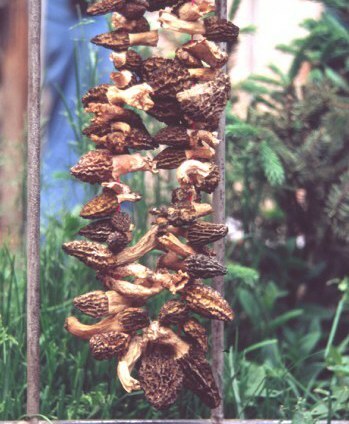 Recent western research indicates that morels have immuno-modulating compounds. One buyer told me that the annual export from Yunnan to Europe is about 30,000 kg, but so far I could not verify that. Figures and estimates I collected from several Tibetan counties indicate local production of 500-2000 kg per season, which would indicate a Tibetan Plateau harvest anywhere from 25,000 - 100,000 kg, but these are very rough guesstimates. The center of the morel trade in Southwest China is Kunming in Yunnan, but there are also brokers in Chengdu, Sichuan. In Kunming and Chengdu, the morels are sorted according to quality for the Chinese market or export to Europe. I just learned from my friend Todd Stagarno that French buyers started to buy directly from Tibetans in Barkam, Aba Tibetan Autonomous Prefecture in Sichuan to cut out Kunming dealers. Most of the morels are destined for Germany and France, where for centuries morels have been collected and enjoyed as a delicacy. In Germany and France, so far no one has heard about the Tibetan name for the morel "khukhu shamo", but everyone has heard about the cuckoo. In Germany, little kids call "koo-koook" when hiding to attract the searcher, just as American kids play peek-a-boo. How helpful it would be if the "cuckoo mushroom" would issue a similar call alerting the pothunter to its hiding place! In French as in English "coucou" is commonly used to denote a person as crazy. Hobby linguists with severe myco-vision, a condition fungo-fanatics are too often susceptible to, would suggest that the term "coucou" surely originates from the coincidental return of the cuckoo from its African winter quarters and the return of the morel initiating the new year's morel craze. Daniel Winkler started mushrooming at age four in the Bavarian Alps. He has a master degree in geography with emphasis on geobotany and ecology. He works as researcher and NGO consultant on environmental issues of the Tibetan Plateau and Himalayas for nearly 20 years. He has published on forest ecology, traditional land-use practices, medicinal plants and in recent years mostly on economic fungi, especially Cordyceps sinensis. Daniel's articles and photo essays are also published on his webpages [www.danielwinkler.com], where there is much more information posted on mushrooms in Tibet. He is a PSMS member since 1996 and lives in Kirkland, WA -USA. This late May and August 2008 Daniel is leading mushroom trips to Tibet.